The world's runways have heated up with Asian fashion models taking on the challenge of becoming a top model. There are those that have helped Asia shed the old moniker of 'developing fashion continent' to become the new fashion capital. We'll introduce Asia's models, who are soaring to the top, as well as the people responsible for producing them. The world's modeling industry used to be dominated by the Caucasian for a long time. However, thanks to the influence of Orientalism and minimalism, Asian models are being seen in a new light. In addition, since the purchasing power of Asians has increased enormously, more brands are targeting the Asian market by employing Asian models. On top of that, 20% of the products of high-end brands are sold in the Chinese market, resulting in the brands hiring Chinese models to specifically target that market. Then, Korean models broke the stereotype that all Asian models look the same with their distinct charming appeals. The craze of modeling academies is hitting Asia. Malaysia's top model Amber Chia opened a modeling academy named after herself and educates young, aspiring models for a bright fashion future for Malaysia. She doesn't only teach how to walk and pose, but also how to sing, act and dance so that the students can become multi-entertainers. "America's Next Top Model" is an American reality television series and interactive competition that premiered in 2003. The franchise was brought to Korea in 2010 and has been producing many promising rookie models. This episode follows the story of Model Choi So-ra, the winner of "Korea's Next Top Model Cycle 3", as well as the production crew that produces a stepping-stone for many aspiring models. The Korean Wave took the Asian modeling industry by storm as well. Korea's leading modeling agency ESteem recently celebrate the 10th anniversary of the founding. Many world-renowned models, including Hye Park, Han Hye-jin, Lee Hyun-yi, Song Kyung-ah, Lee Hye-jung, Park Ji-hye, Soo Joo and Kim Sung-hee gathered together to shoot the agency's commemorative pictorial. ESteem is respected and considered a benchmark for modeling agencies not only in Korea, but all across Asia. They support the models' dreams, and plan various projects to build and diversity the models' images. As part of their project, rookie model Irene presented diverse events at 2014 New York Fashion Week, and conveyed the hot atmosphere of the Fashion Week through her SNS. 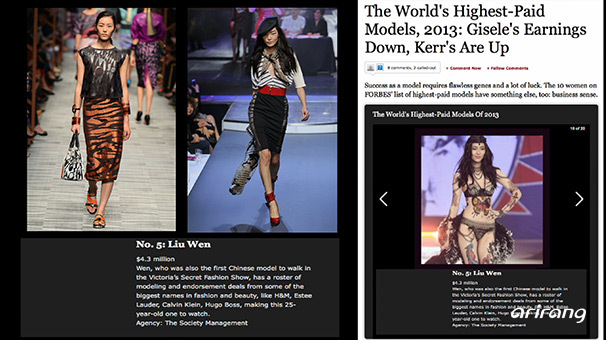 Asian models have enchanted the world's runways. Now, they're making their mark in the history of the fashion industry.